It's Not Work, It's Gardening! 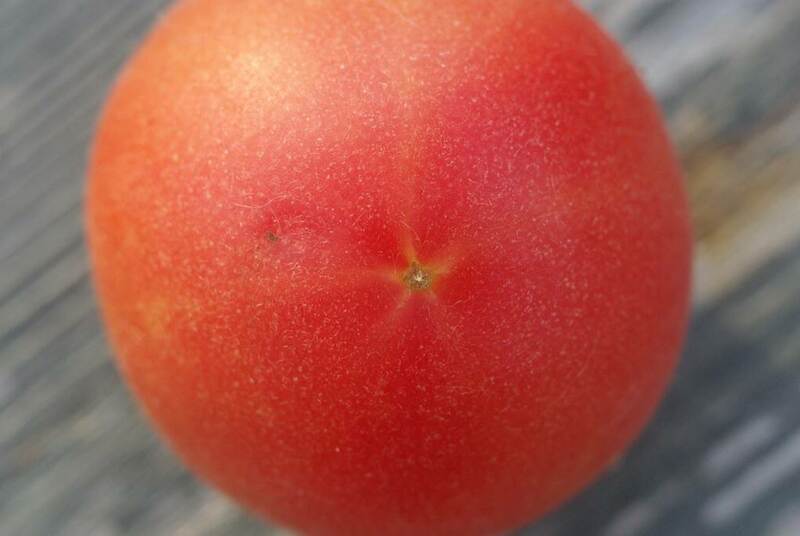 : A real peach! The tomatoes are starting to ripen! Oh, it's just a few here and there, and they are the smaller first fruits produced by the plants, but it's still exciting. Especially since I have a few new varieties this year in my small veggie garden. 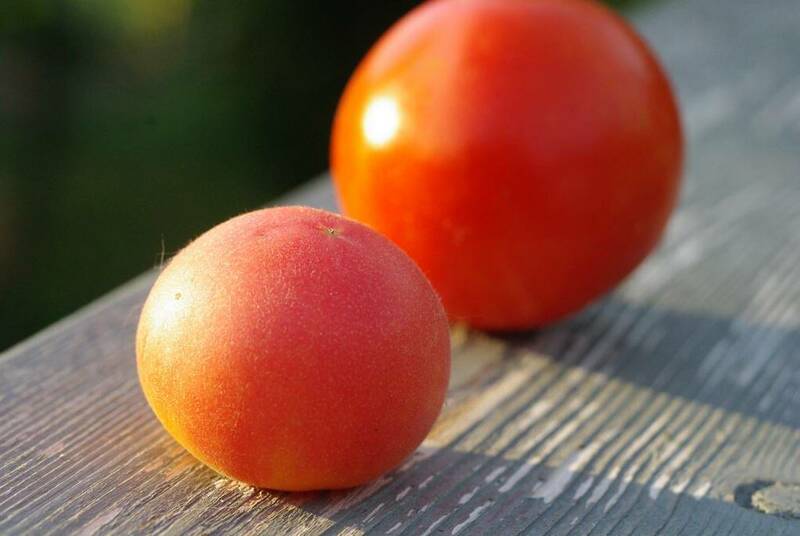 Did you know that there are more than 4,000 different tomato varieties? Or maybe it's 8,000... or 10,000. I can't remember the number I read, but believe me once you get into the thousands it doesn't really matter what numeral is prefixed -- you're never going to grow all of them. 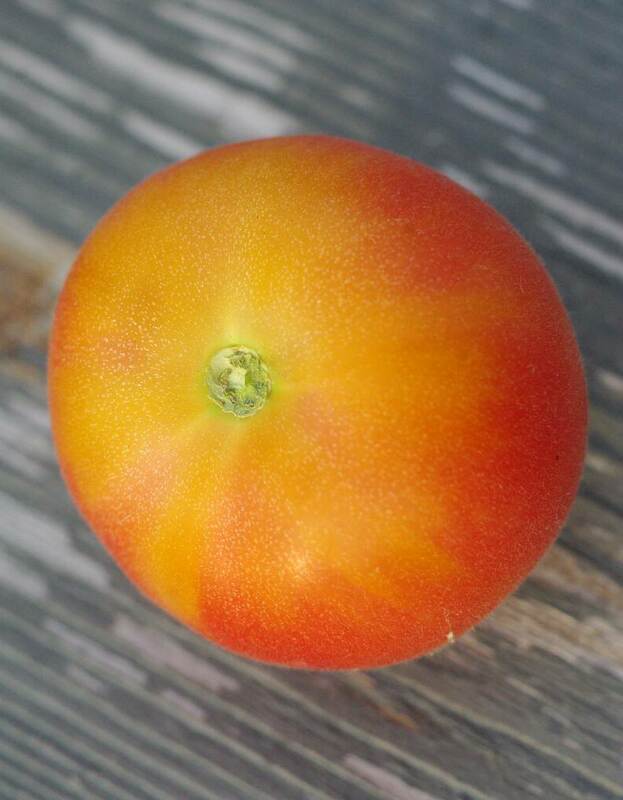 This year I had access to a dozen or two different heirloom tomato seed varieties, and I pretty much just chose which ones to plant based on their names. 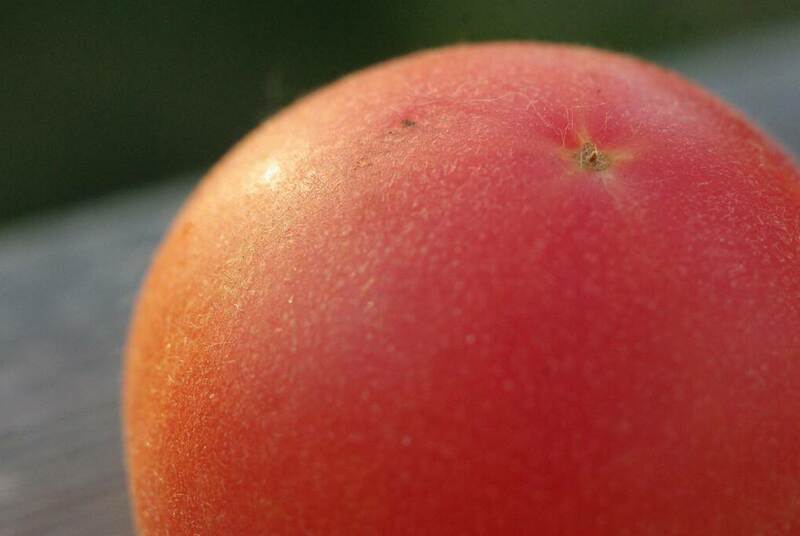 'Tangerine' and 'Garden Peach' both made the cut. Once I planted them out in the garden, I lost or buried the small plant markers that were in their seedling pots, and I lost track of which of the two plants were which. I think I've identified them again though. 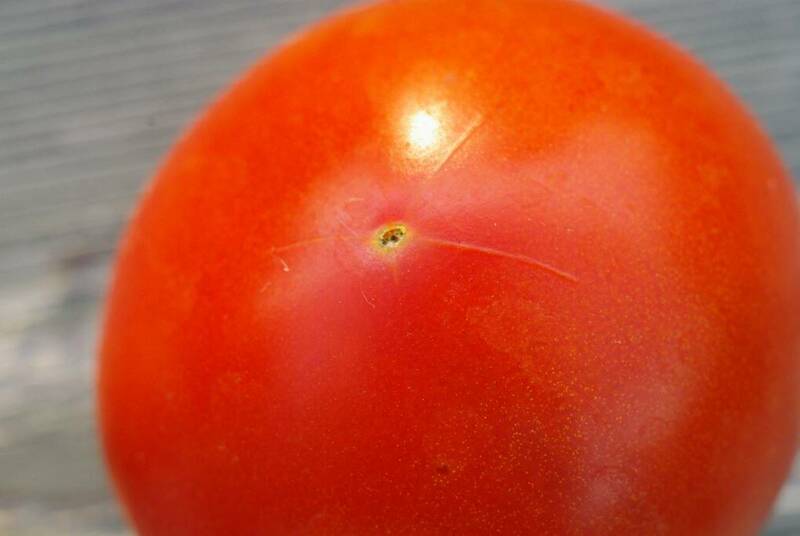 These are photos of a "regular" red tomato. 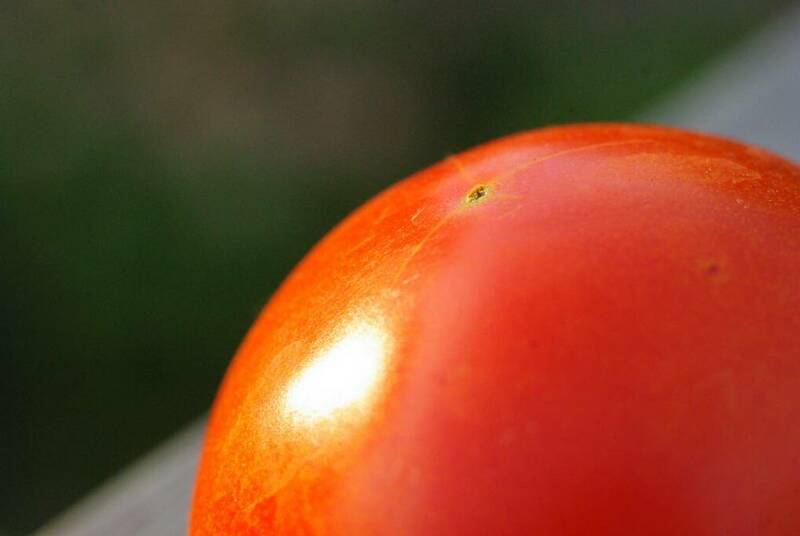 It's not yellow or striped or "black" or giant or anything special, just a nice red tomato. Can you see how fuzzy it is? It's quite fuzzy! "Honey look, a new type of tomato is growing in our garden!" "Oooh, look how fuzzy it is! Let's eat it!" "You read my mind -- there's nothing better than hairy fruits!" It's a bit pinker than it appears to be in this photo. 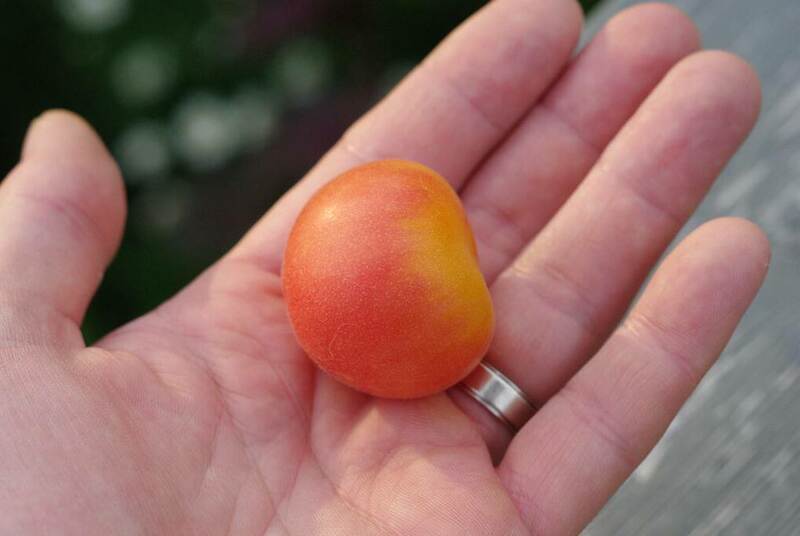 Small, though that's probably because it is the first of the fruits. I never remove the first blossoms when I plant my seedlings. I guess I should. Unfortunately this plant appears to be in decline, as most of the leaves have withered and dropped. I don't know that I've ever had problems growing any tomatoes before, but I there are so many factors involved: first year I'm using manure, first time I've tried this variety, there's a HUGE tomato variety growing right in front of this one possibly blocking most of its sunlight. I took some cuttings (I hate throwing away large tomato branches that I prune off) which have rooted in water, so hopefully I'll have another one of these plants soon, as I'd like to see if these fruits get any bigger. Now to see how these little fuzzies taste! Tomatoes? Already! We're at least four weeks from any hope of a tomato here in the Chicago area. We also chose our heirlooms by name - very scientific! 4000 varieties makes it very difficult to choose which ones to grow!